Kongsberg Maritime is a global marine technology company providing innovative and reliable technology solutions for all marine industry sectors, including merchant, offshore, subsea and naval. Headquartered in Kongsberg, Norway, the company has manufacturing, sales and service facilities in 17 countries. Kongsberg Maritime develops automation, control, navigation, dynamic positioning, hydroacoustics, AUV / underwater navigation / communication / camera systems, and marine and offshore simulators. All Kongsberg Maritime deliveries are customised to meet exact customer requirements and benefit from high-quality design and manufacturing. Kongsberg Maritime delivers solutions that cover all aspects of technology underwater and on the water, on-board new build and retrofit vessels, as well as on offshore platforms and rigs, often under a single supplier strategy called ‘The Full Picture’. Kongsberg Mesotech, Kongsberg Maritime’s Canadian subsidiary, is a global leader in underwater acoustic technology. Characterised by exceptional engineering capabilities, the company focuses on providing customers with superior image resolution by producing quality and reliable equipment. Kongsberg Mesotech supplies a worldwide customer base with products for search and recovery, marine engineering, security and surveillance, fisheries and various other underwater applications. It provides an extensive support network, including training, product support and assistance with application and data interpretation. The Diver Detection Sonar (DDS 9000/9001) is a complete detection, tracking and classification system, consisting of a high-frequency sonar developed by Kongsberg Mesotech and processing software developed by Kongsberg Defence Systems. Once identified and tracked, targets are classified and the direction of travel is predicted. The autonomous detection tracking and classification software distinguishes between divers and marine life, which are of similar size and speed to human divers. The target icons and tracks are displayed on the operator’s screens with NATO STANAG icons as a standard. Divers are classified as threats within operator-specified alert zones, and announced with audio and visual alarms. The ST2400 Variable Depth Sonar (VDS) is the newest addition to Kongsberg Maritime’s naval sonar portfolio. The ST2400 is a replacement for the well-proven ST240 and is part of the KM Littoral ASW system in combination with the hull-mounted SS2030 ASW sonar. 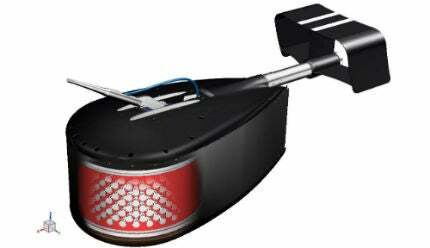 The ST2400 is a medium-frequency sonar designed with an emphasis on operating in shallow and confined waters. Special features and capabilities are implemented to improve performance and operation in shallow waters. Advantages of the ST2400 are its compact size, which enables high-speed operation and rapid deployment and retraction. The compact design makes the ST2400 a portable sonar as it can be moved and installed on a ship within an hour. The COTS technology allows the sonar to be easily integrated with sensors and combat management systems. Key features of the VDS are omni and sector transmission, electronic map overlay, sound propagation model, advanced tracking and detection, as well as a built-in simulator for training. The main purpose of the SA9510S mine avoidance and navigation sonar is to detect mines and obstacles in a wide swath (120° x 90°) ahead of the submarine. The sonar generates a target warning or alarm, leaving enough time to perform an avoidance manoeuvre. The SA9510S provides information to the crew for submerged navigation purposes. In addition, the sonar can detect and display bottom profiles (bathymetry) in front of the submarine for use in terrain referenced positioning. The sonar is equipped with one vertical and one horizontal array, which are electronically steerable in two directions. In addition, the sonar has the capability to transmit and receive information on both the vertical and the horizontal arrays. Mine seeking and submerged navigation can be performed simultaneously. Emphasis has been placed on the sonar’s shallow water capabilities, with features and the flexibility to select the optimum settings for the relevant environment. The sonar operator can optimise the performance by selecting pulse types, length and shapes, and customised pulse trains, or by varying the source level, and choosing narrow or wide sector widths. For easy and effective operation, the operator can select pre-programmed parameter settings for specific missions. The SA9520 mine avoidance and navigation sonar is a high-frequency wideband sonar designed with an emphasis on detection and early warning of navigation obstacles, including mines. The SA9520 uses Kongsberg Maritime’s newest in-house composite transducer technology and is a further development of the widely used and well-proven SA950 MOAS. The SA9520 enhances shallow water detection capabilities and operation in narrow straits. It has similar sonar operation and optimal performance capabilities as the SA9510S sonar, including the selection of pulse types, pulse length and shapes, and customised pulse trains, or varied source levels, and choice of narrow or wide sector widths. In addition, it has built-in capabilities of generating depth profiles ahead of the vessel in selected directions. The sonar has the possibility to transmit and receive information on both the vertical and the horizontal transducer array. The vertical array provides resolution that allows for the positioning of objects in depth and to discriminate targets vertically as bottom, volume or surface targets. The horizontal array is capable of forming narrow single beams put together in a wide horizontal sector, providing large coverage (120° x 90°). The narrow single beams in the horizontal plane give exceptional position accuracy in bearing. Kongsberg Maritime has introduced a new tow fish side scan sonar for use in search and recovery (SAR) missions, as well as underwater inspection, engineering and scientific surveys. The KM Marine CCTV System is a ruggedised digital marine CCTV system. REMUS M3V (Micro 300 Meter Rated Vehicle) is a new member of the REMUS family of autonomous underwater vehicles (AUVs), which is developed by Hydroid, a US-based subsidiary of Norwegian firm Kongsberg Maritime. The Katanpää Class mine countermeasure vessels (MVMVs) are built by the Italian shipyard, Intermarine, for the Finnish Navy. The BAP Carrasco (BOP-171) is an oceanographic and polar research vessel built by Spanish shipbuilding company Construcciones Navales P Freire, for the Peruvian Navy. The vessel was launched in Vigo, Galicia, Spain, in May 2016. The Multimode Multibeam Sonar (M3 Sonar®) from Kongsberg Maritime's subsidiary Kongsberg Mesotech Ltd is now part of a new acoustic transponder tag monitoring system being introduced to the fisheries research community during the American Fisheries Society annual conference in Portland, Oregon this week. Swede Ship Marine will install new Kongsberg Maritime sonar systems as part of a major rebuild and lifetime extension of five patrol boats for the Swedish Navy. Released to selected trial customers earlier this year, the next-generation software for Kongsberg Maritime's GeoSwath Plus shallow water multibeam echo sounder has already been put through its paces on the river Douro in Northern Portugal by one of the country's leading survey companies, Lagoa do Ruivo Survey (LRS). Scientists have been using sonar and echo sounder systems on vessels for decades to conduct fish surveys. Kongsberg Maritime has extended its portfolio of sophisticated, scientific hydroacoustic products with the launch of the Simrad EK80, a high-precision, wideband echo sounder. The new 'RV Kronprins Haakon', the first Norwegian Icebreaker built for Polar research, and the first purpose-built polar research vessel since Roald Amundsen's 'Maud' launched in 1917, will start regular science cruises in 2017 with a complete hydroacoustic systems package from Kongsberg Maritime. Kongsberg Maritime has donated and installed a K-Pos Dynamic Positioning System aboard the Norwegian University of Science and Technology (NTNU) owned R/V Gunnerus research vessel. Kongsberg Maritimes is introducing a new member in its family of Motion Monitoring Units at Ocean Business 2015. Kongsberg Underwater Technologies, Inc. (KUTI) has announced that it has delivered the first Seaglider™ vehicle equipped with a Rockland Scientific International (RSI) MicroPod™ turbulence sensor. The vehicle was commissioned by the University of East Anglia, UK. L'Institut Polaire Français Paul-Emile Victor (IPEV - the French Polar Institute) has chosen an extensive Kongsberg Maritime subsea hydroacoustic package for the mid-life upgrade of the R/V Marion Dufresne. Kongsberg Maritime has successfully completed the customer acceptance testing (CAT) for the first delivery of its HUGIN autonomous underwater vehicle (AUV) with a new cNODE integrated subsea positioning and communication system. During the testing of the innovative new package, which took place during Quarter 1, 2015 in the deep waters outside the coast of Bali, Indonesia, and the Indian Ocean, HUGIN reached a record operational depth of 4,449m. Kongsberg Maritime has launched an advanced MK-II version of its de facto industry-standard EM® 710 multibeam echo sounder. The new EM 710 MK-II sets new standards for seabed survey by increasing range and swath coverage over the original EM 710 by up to 40%. Kongsberg Mesotech's M3 Bathy System, a powerful, entry-level survey system for shallow-water bathymetric applications is now officially designated compliant with IHO S-44, a reference standard for companies engaged in hydrographic surveying, marine engineering or nautical charting.